The plan is to make a platform where you can insert different analog modules and interconnect them as you like. 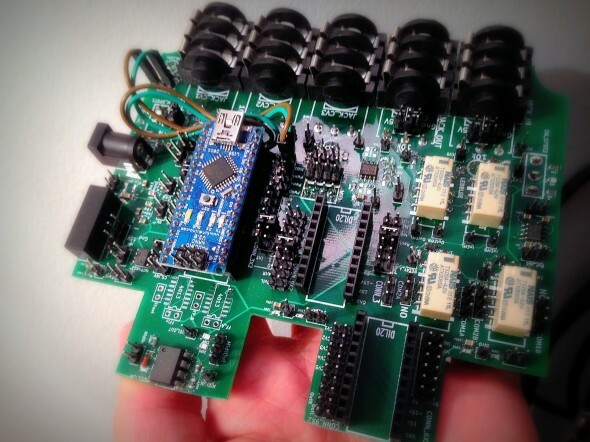 You can even add an arduino or something to add digital control over the analog modules. The goal is that is should be simple to start learning analog design on a ready-made plattform. In the box it is a main board with room for 2 analog modules and 1 Arduino Nano (for digital control). Then it is possible to put wires between the different parts to make the effect you want! By combining modules like a VCA(Voltage Controlled Amplifier), VCO(Voltage Controlled Oscillator), VCF(Voltage Controlled Filter), Variable Delay, mixer and a multiplier(modulator) you can make a lot of different effects. Think modular analog synthesizer and you’re on the track..